Grilling hearty slabs of tofu for a summery "Tofu Steak" is one of my favorite Meatless Monday meals. No soft, bland, squishy tofu here. These Tofu Steaks are super firm, grilled golden, and bear that delicious smoky taste of the grill for a meatless dish that still packs a ton of protein. 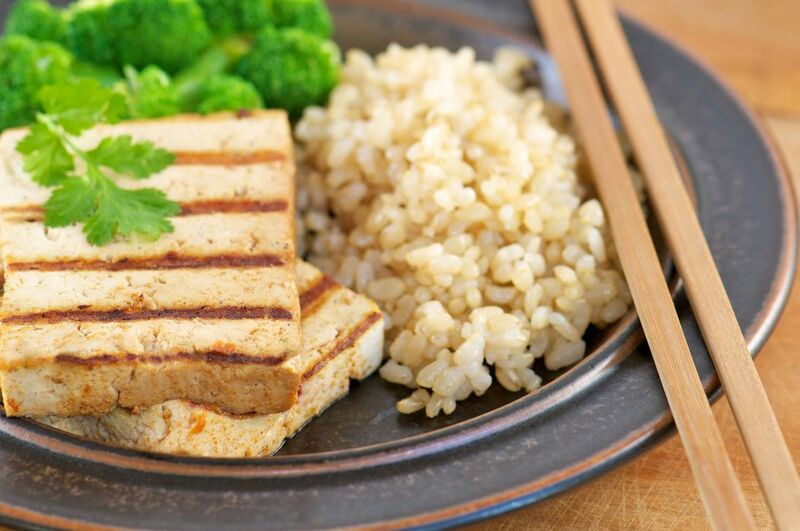 My favorite type of tofu to use for Tofu Steaks is High Protein Super Firm Organic Tofu by Trader Joe's. It is exactly what it says - SUPER Firm. So firm that it won't crumble or break into pieces as you grill it. Simple flipping without the fuss of trying to keep the tofu together. It also has 14 grams of soy protein per serving and is gluten-free. If there is no Trader Joe's near you, you can use another brand of Super Firm Tofu - just make sure it's gluten-free and Super Firm so it doesn't break apart on the grill. Because the tofu is so firm, it is easy to slice into 1/4" slabs to arrange on the grill. For a heartier piece, slice thicker to 1/2". Season these Tofu Steaks simply with a spray of canola oil, cracked black pepper, and sea salt. Grill on medium-high for about 5 minutes each side, until golden brown with those beautiful charred grill marks. These Tofu Steaks are incredibly versatile. Enjoy with a side of brown rice and vegetables for a healthy dinner, or slice and stuff into warm corn tortillas for Tofu Tacos. I've bee pairing these Tofu Steaks with creative sauces all summer long: Tomato Mint Pesto, Garlic Scape Pesto, and Chimichurri are my three flavorful, gluten-free favorites. Rinse the tofu and pat dry. Slice into slabs a little larger than ¼" thick. Spray both sides with canola cooking spray and season generously with salt and pepper. Before turning the grill on, spray the grates with canola oil cooking spray. Pre-heat the grill over medium-high heat. Once the grill is hot, arrange the tofu steaks around the center of the grill. Close the lid and grill for about 5 minutes, until golden with grill marks on the bottom side. Flip the tofu steaks and grill for an additional 5 minutes, with the grill lid closed. Remove steaks from the grill. Top with a generous serving of this Tomato Mint Pesto or another gluten-free sauce of your choice. Serve immediately.